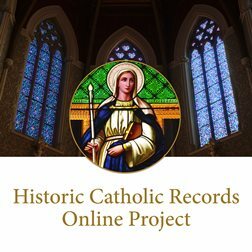 The New England Historic Genealogical Society's database at AmericanAncestors.org has continued to expand its online collection of Massachusetts: Roman Catholic Archdiocese of Boston registers, 1789-1900. The latest parish volumes to be fully imaged, indexed and available to search are listed below. From a total of 19 volumes, more than 94,504 records have been transcribed, delivering a total of 326,377 names. St. Mary (Lawrence) – Baptisms, 1848-1900; Confirmations, 1855-1890, with gaps; Marriages, 1849-1900. St. Augustine Chapel and Cemetery in South Boston is celebrating its bicentennial this year. The chapel is the oldest surviving Catholic place of worship in Massachusetts; it was established to be the final resting place of Father Francis Matignon, one of the pioneering figures who helped establish the Catholic church in Boston. As part of the bicentennial celebrations, a database of its cemetery records, dating from 1819-1859, has been created and uploaded to AmericanAncestors.org: Boston MA: St Augustine Cemetery Records, 1819-1859. This database contains a mix of original records and copied volumes that include lot sales, burials, deaths, and gravestone inscriptions. The volumes labelled “Gravestone Inventory” were created during a preservation study of the cemetery undertaken in the 1980s. There are more than 15,000 records and 62,000 names available to search in this database, which is available to all NEHGS members and free guest members.